Online sites such as BuzzFeed and Pinterest are full of “hacks” that provide solutions to common problems by using everyday objects in uncommon ways, like protecting a razor head with a binder clip or wrapping shoes in a shower cap for travel. These ingenious ideas are the result of divergent thinking (DT)—an outside-the-box approach that generates unusual or creative alternatives to persistent challenges. DT drives adaptive innovation and is important when problems require a shift in perspective or the development of flexible, original solutions. In laboratory studies, DT is measured with tasks that require individuals to complete picture fragments with novel drawings or to generate alternative uses for common objects (for instance, turning a paper clip into a fishing hook or an earring). Although pondering different uses for a paper clip may seem somewhat frivolous on the surface, longitudinal studies of DT suggest that children’s scores on these sorts of tasks predict their personal and professional creative achievements as adults. Thus, the ability to think divergently may be established early in life and may influence people’s capacity for making meaningful, influential contributions at home or work. The potential significance of DT as an adaptive tool brings up several questions: When does this ability emerge? Is DT genetically linked, such as intelligence and other cognitive abilities? Can DT be taught or enhanced? To begin to answer these questions, a team of researchers led by Elena Hoicka, now at the University of Bristol in England, investigated DT ability in toddlers and their parents. They wanted to know whether DT can be reliably measured in children as young as one year of age and, if so, whether their DT scores were linked to those of their parents. Because most one-year-old children cannot answer questions such as “name all the ways that you can think of to use a button,” a first step in their investigation was to examine the utility of a nonverbal test of DT in one-year-old children. The Unusual Box Test (UBT) examines the ways in which a child interacts with a box that has unique features (for example, strings, ledges, a hole, stairs, rings) and five different objects (hook, spiral egg holder, feather). The UBT provides a measure of novel idea generation, with higher scores on the UBT indicating a greater number of original box-object interactions. The UBT shows good test-retest reliability in two-year-olds, and scores on the UBT correlate with scores on other standardized measures of DT in three- and four-year-old youngsters. Hoicka and her colleagues tested a group of one-year-olds on the UBT by presenting the box on a turntable so that all its features were accessible. They then presented each of the five objects one at a time and allowed the toddlers to play. The toddlers were tested individually and, most important, were given no instructions other than to play with the box and the objects. Researchers counted the number of unique box-object interactions that each child generated within a set time frame. The scores for the 29 toddlers ranged from 6 to 28, and those who scored high on their first interaction with the task tended to score high when they were tested again two weeks later, even when the researchers counted only brand-new box-object interactions on the second test. Thus, the consistency across tests did not reflect memory for (and repetition of) previous interactions. These data suggest that there are indeed individual differences in DT that can be measured as early as age one and that these measurements are reliable, at least over short time spans. Children thus demonstrate an aptitude for divergent creative thought early in life, but where does this ability come from? Do toddlers with a high DT aptitude have parents with high DT? To explore this question, Hoicka’s team also tested parents’ DT using two different nonverbal tasks from the Thinking Creatively in Pictures Test. These tasks involved completing incomplete abstract line drawings and filling in 24 circles with pictures. Toddlers’ DT scores correlated with their parents’ DT scores, even when researchers controlled for the toddlers’ motor-skill development. Thus, children with high DT scores tended to have parents who showed high DT. Are genetics at play here? Maybe so. Recent research suggests that variants of specific genes may affect creativity, and therefore the correlation between toddlers’ DT scores and their parents’ scores could reflect the influence of these genes early in life. In addition, DT may be mediated in part by working memory, and evidence suggests there is a genetic component to working memory as well. Don’t be too concerned for your children, though, if you and your partner are not the most creative people on the planet. Other research examining creativity in twins found no differences in creativity between monozygotic and dizygotic twins, suggesting that genetic factors are only part of the answer. Social learning most likely contributes to the correlation between parent and toddler DT scores, given that toddlers are keen imitators and like to copy others. In fact, research demonstrates that children who watch someone else with high DT tend to improve their own DT scores, whereas those who are exposed to low DT behaviors reduce their own DT. Thus, even if your child is not genetically inclined to be creative, she can learn to think outside the box by observing others. She will, however, need a creative role model. So go ahead and watch that Buzzfeed video, scroll through Pinterest or even simply go for a walk—you’ll fuel not only your own creative spark but also perhaps that of your child. Individual Differences and Age-Related Changes in Divergent Thinking in Toddlers and Preschoolers. Simone Bijvoet-van den Berg and Elena Hoicka in Developmental Psychology, Vol. 50, No. 6, pages 1629-1693; March 2014. 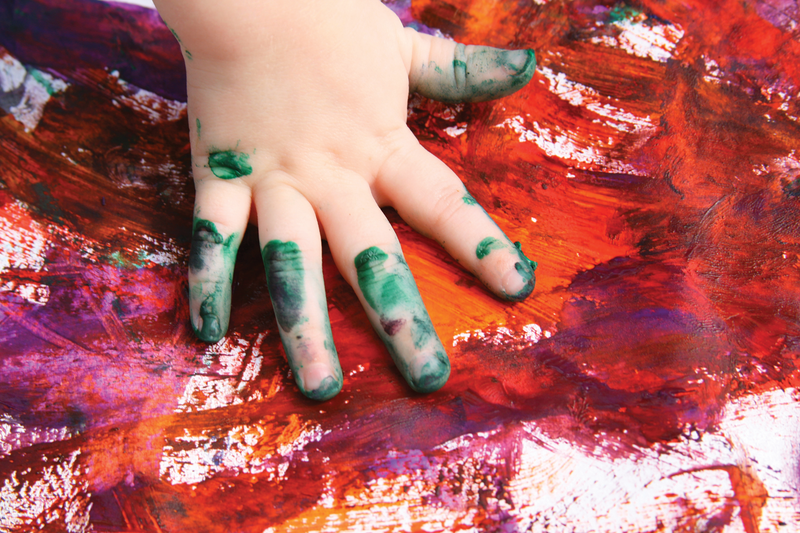 One-Year-Olds Think Creatively, Just Like Their Parents. Elena Hoicka et al. in Child Development, Vol. 87, No. 4, pages 1099-1105; July/August 2016.